The Box of Chocolates Air Freshener adds delectable mouth-watering chocolate scent to freshen any stinky space without the mess or calories! 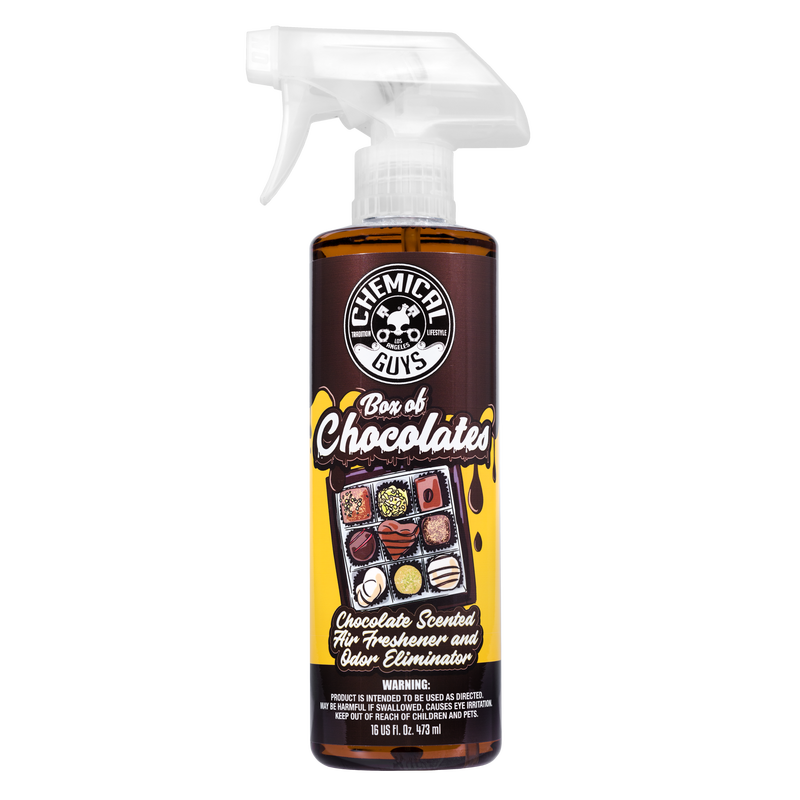 They say chocolate cures everything, and this all-new air freshener proves it… just one spray eliminates odors, lifts moods, and gets endorphins flowing to refresh all your stinky spaces with the irresistible scent of deliciously rich chocolate. This air freshener makes it possible to enjoy chocolate anytime and anywhere, without the calories, guilt, or mess. Spray it in your car for sweet chocolate scent without the melted gooey mess, or at home to get mouthwatering cocoa scent without the ants. Now, you don’t even have to risk getting a flavor you don’t like out of the chocolate box… with this air freshener, every spray unleashes the sweet scent of everyone’s favorite guilty pleasure! Having a bad day? Mist this air freshener to get all the comfort without the calories! Picking up a hot date? Spritz this air freshener in your cabin to get the perfect romantic aura! If your perfect Valentine’s Day consists of you, your car, and the open road, pick up the Chemical Guys Box of Chocolates Air Freshener and Odor Eliminator!